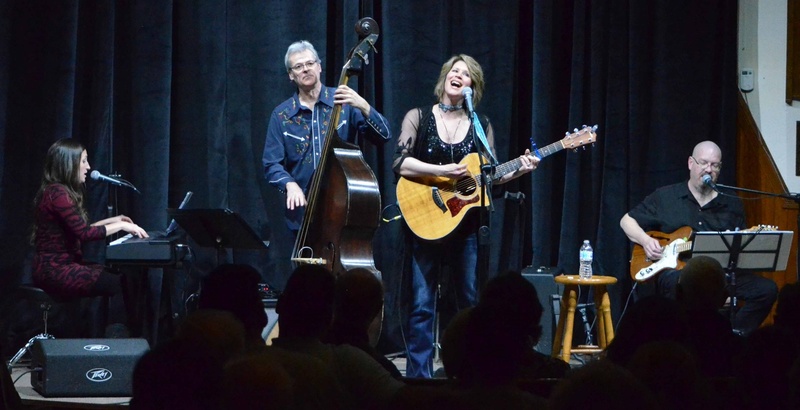 On April 6th, 2019, a full house at The Mary Webb Centre for the Arts was treated to a wonderful concert with Lisa Brokop and her “Legendary Ladies of Country” project. Accompanied by three very talented musicians and singers, Lisa sang songs by legends such as Patsy Cline, Loretta Lynn, Tammy Wynette, Dolly Parton and Emmylou Harris as well as a few of her own. Lisa told the story of how she grew up listening to all of these great singers and songwriters and describing her own journey to become a well-known singer/songwriter. After a standing ovation, Lisa came back for an encore, finishing with Amber and Paul accompanying her in a stellar “a cappella” version of “The Tennessee Waltz”. The crowd would have stayed for many more songs. One person, as she was leaving asked “Is Lisa coming back next Saturday?” That pretty much summed up how many felt. Hot on the heels of “The Patsy Cline Project” is Lisa’s brand new show ‘Legendary Ladies of Country’! This presentation will feature songs from many of the greatest female country singers of our time including Loretta Lynn, Tammy Wynette,, Tanya Tucker and Emmylou Harris. There will be stories from Lisa about what these songs have meant to her and the influences that these ladies have had on her career. And Lisa Brokop fans will also enjoy hearing a few of Lisa’s own hits in the mix as well!